Custom Photo to Canvas is a great new way to display your digital photographs! The simple process of taking a photograph, uploading it to our design tool, and placing the order is all it takes! With this stylish new trend you'll be able to display your finest photographs anywhere you wish, just in a bigger, better, and fun way! If you have an older photograph or any type of picture you want to add to canvas, no problem. We can scan any photograph at a high resolution and have it done the same way we would with a digital picture. 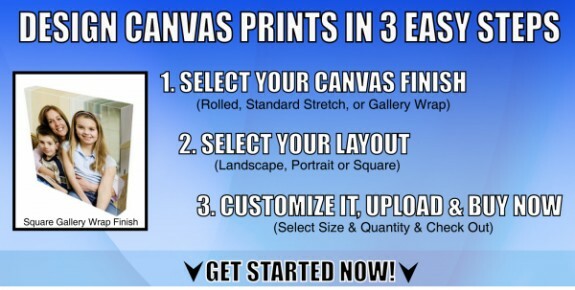 Whether you are an avid photographer, an amateur photographer, or simply a customer with a digital camera, this amazing process of adding any type of photo to a canvas background is truly amazing and makes a wonderful gift for ANY occasion. Click Image above for a Quote! Gallery Wrap is a method of stretching an artist's canvas so that the canvas wraps around the sides (stretcher bar or strainer bars) and is secured to the back of the wooden frame. The frame is usually 1.5" thick. The result is the hardware (staples or tacks) used for securing the canvas is not visible on the sides. The sides of the canvas are prepared and primed in the same manner as the face, which may then be painted a solid color or painted to continue the image appearing on the face. This method of stretching and preparing a canvas allows for a frameless presentation of the finished product.